Currently in Nashville there is some debate about a proposed school rezoning plan. This issue has been tough for me, for I have good friends on both sides of the debate. The issue has been tough, for it not only involves concerns about the children and the allocation of resources by the schools, but also generational differences between those who live through the civil rights movement and the establishment of segregation by busing here in Nashville, and those who have inherited their legacy and are less likely to see sinister motives behind every decision. It is the difference between Jeremiah Wright and Barack Obama, one a fighter battling for justice, and the other a reconciler, attempting to build and sustain relationships. My main concern in this debate is the sharing of incomplete data by groups opposed to the issue which fails to recognize the complexity of what the school board faced. At this point, I am not trying to defend their decision, for I am still in the throes of evaluation. But what I have continued to discover is that the lack of information (something that is not being completely shared by the school system) is leading folks toward knee jerk decision making rather than discerning a correct path in a complex world. In the interest of trying to start some conversation, I want to share quickly some a breakdown of the Nashville School System as a whole in comparison to the city as a whole. Most folks have no idea that the school system population is so radically difference from our city’s demographics.This trend has been happening for several years, and there is little reason to believe that it will change in the coming years. Why the discrepancy? 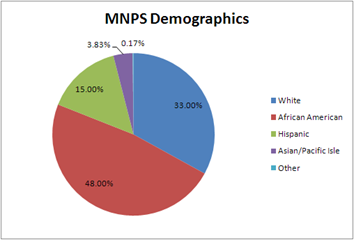 A combination of white flight and a growing Hispanic population primarily. 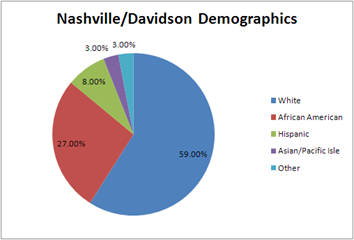 It is difficult to fully know how to compare the Nashville children’s poverty levels with that of the school system, which uses the “free lunch” program as a means for identifying economically challenged persons. Certainly, there could be parents scamming the system to get their kids a free lunch. But the numbers still suggest that all in all students attending Metro Public Schools are likely to have financial struggles in their families, and that the preponderance of students will be from the traditional minority community. It would be interesting to find the statistics from 1971-72 prior to desegregation to see how they compare to today’s world. Jay, Thank you for calling for serious discussion of this issue. The public schools are being abandoned by those who can afford private alternatives and our system of funding education is so inadequate I think the schools are in peril. And, we struggle with quality in addition. A serious discussion about public education is urgently needed. For well over 30 years my wife and I have strongly supported public education. In the early era of desegregation, “white flight” dramatically affected the public school demographic. Over 35 years later, the current pubic school demographic reflects not so much racism but more social, cultural, economic factors. It would appear that the only way to guarantee any improvement in public education would be to eliminate private alternatives. Then all parents would be forced to support public education since all children would be forced to attend public schools. As well there would then be a broader willingness of taxpayers to support the cost of public schools since students and their parents would have no alternatives for education.